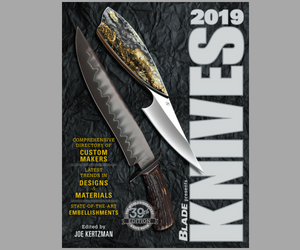 Now we all know that knifemakers are innovative, and we’ve seen incredible creativity in design, blade grinding, handle materials, damascus forging, one-hand-opening folder mechanisms, locks and gadgets. Trends don’t just happen without innovation. But using a radioactive isotope of hydrogen on a knife? One called tritium that contains one proton and two neutrons, an isotope that is rare on earth where trace amounts are formed by the interaction of the atmosphere with cosmic rays? Does it sound like science fiction? No, it’s non-fiction, real life, and true that some knifemakers inlay tritium into knife handles because it glows, looks incredibly cool and might actually help a guy stumbling around in the dark find his knife. That last part might be a stretch, but it’s not the first time knifemakers have looked to the stars to find knife handle and blade material. They’ve been forging meteorite into knife blades and using it in handles for millennia. There’s mystique and legend surrounding ancient Egypt, and Tutankhamun, who had meteorite forged into a blade before the use of iron, of gold/meteorite knives among the Mongols or James Black using meteorite in Col. James Bowie’s blades. More commonly, knifemakers shape and often anodize titanium, using it for bolsters, liners and handles, or laminate two or more titanium alloys into patterns resembling damascus and resulting in what is known as Timascus. Various alloys color differently by heating or anodizing them, so the color combinations are endless, like the stars in the sky, the cosmos and the galaxies beyond. This article was excerpted from the Trends section of the KNIVES 2016 annual book. For more incredible knife images and information like it, click here to get your copy of KNIVES 2016, and enjoy! Previous articleBone Handle Knives: Bone in the USA!